BRINGING MUSIC OUT OF STUDENT MUSICIANS IS THE PRIVILEGE OF SOUTHEASTERN MINNESOTA YOUTH ORCHESTRAS’ (SEMYO) CONDUCTORS SARAH GIFFORD AND SUSAN OFTEDAHL. Gifford takes the baton for the philharmonic orchestra while Oftedahl conducts the chamber strings. Rochester native and Mayo Clinic employee Sarah Gifford started out playing piano. She came to enjoy playing accompaniments with other musicians, rather than doing solo pieces. “My journey with the clarinet was a little more thorny,” she says. While not her first choice of instrument, she stuck with playing and found she enjoyed it. “I love music and playing with a group,” she explains. She also plays clarinet in local ensembles and teaches private lessons. Susan Oftedahl’s music journey began with her father, a former music college professor. It was his job at Minnesota State University in Mankato that moved her family to Minnesota. He took Oftedahl and her brothers to see a variety of student and professional musical performances. She plays cello in the Rochester Symphony with a cello that was a gift from her father and was made by David Folland, a luthier (a maker of stringed instruments such as violins or guitars) in Northfield. “The enriched sounds deepen my enjoyment of playing,” she says. 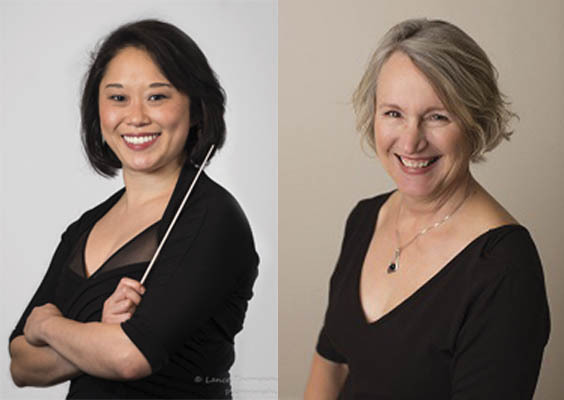 You can find both women conducting at SEMYO’s Fall (November 11), Winter (March 3) and Mother’s Day (May 12) concerts. SEMYO also hosts a concerto competition at the end of January. For more information and a calendar of events, visit semyo.org. Anna Matetic is a freelance writer who enjoys Rochester’s growing music scene. This entry was posted in Community on November 1, 2018 by Anna Matetic.